Largemouth bass grow 4 to 6 inches (10 to 15 cm) during their first year, 8 to 12 inches (20 to 30 cm) in two years, 16 inches (40 cm) in three years. They are usually green with dark blotches that form a horizontal stripe along the middle of the fish on either side. The underside ranges in color from light green to almost white. They have a nearly divided dorsal fin with the anterior portion containing nine spines and the posterior portion containing 12 to 13 soft rays. Their upper jaw reaches far beyond the rear margin of the eye. 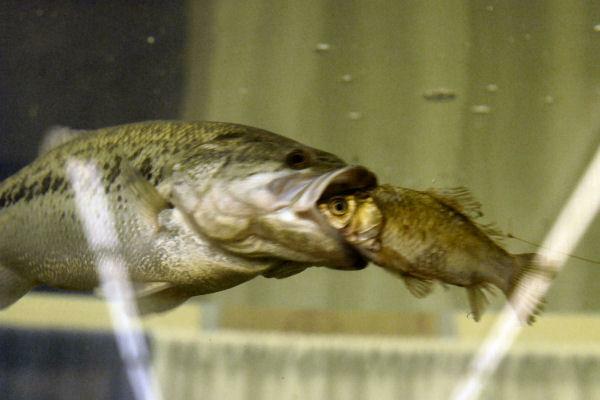 Except for humans, adult largemouth bass are the top predators in the aquatic ecosystem. Fry feed primarily on zooplankton and insect larvae. At about two inches in length they become active predators. Adults feed almost exclusively on other fish and large invertebrates such as crayfish. Larger fish prey upon smaller bass. In Texas spawning begins in the spring when water temperatures reach about 60°F. This could occur as early as February or as late as May, depending one where one is in the state. Males build the nests in two to eight feet of water. Largemouth bass prefer to nest in quieter, more vegetated water than other black bass, but will use any substrate besides soft mud, including submerged logs. As in Guadalupe bass, once the female has laid eggs in the nest (2,000 to 43,000) she is chased away by the male who then guards the precious eggs. The young, called fry, hatch in five to ten days. Fry remain in a group or "school" near the nest and under the male's watch for several days after hatching. Their lifespan is on average 16 years. Immature largemouth bass may tend to congregate in schools, but adults are usually solitary. Sometimes several bass will gather in a very small area, but they do not interact. Largemouth bass hide among plants, roots or limbs to strike their prey. Largemouth bass seek protective cover such as logs, rock ledges, vegetation, and man-made structures. They prefer clear quiet water, but will survive quite well in a variety of habitats. Largemouth bass were originally distributed throughout most of what is now the United States east of the Rockies, including many rivers and lakes in Texas, with limited populations in southeastern Canada and northeastern Mexico. Because of its importance as a game fish, the species has been introduced into many other areas worldwide, including nearly all of Mexico and south into Central and South America. Two subspecies of largemouth bass exist in Texas: the native Micropterus salmoides salmoides and the Florida largemouth bass, Micropterus salmoides floridanus, which has been introduced into many Texas lakes. The largemouth bass is by far the most sought-after fish in Texas. When anglers were asked to "name the fish you prefer to catch in freshwater in Texas", they chose largemouth bass three to one over striped bass, four to one over white bass, nearly five to one over channel catfish, and nearly ten to one over flathead catfish and white crappie. Because of the strong interest in largemouth bass fishing, there are hundreds of bass angling clubs in Texas devoted to fishing and conservation. Bass fishing adds greatly to the Texas economy each year and largemouth bass are highly prized for their value as food. Because of the species' popularity, it has been introduced into many waters in which it did not originally occur. As with nearly all aquatic species, pollution and d rought are the biggest threats to the largemouth bass population.